Experience the magical charm and rustic ambiance of Rajasthan at Lakshman Sagar, a 19th century hunting lodge built by Thakur Lakshman Singh to host noble families and British colonial officers during their hunting expeditions. 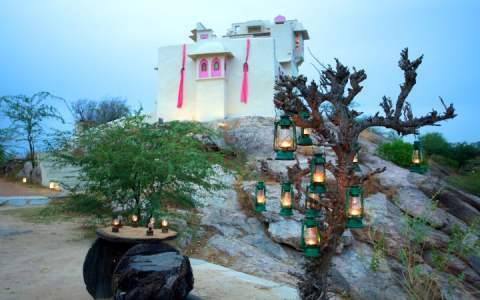 Now a secluded resort in India, the ethnic design and architecture of this hunting lodge will remind you of the golden era of Mewar rulers and their aristocratic lifestyle. The wilderness and fascinating landscape of Pali region makes Lakshman Sagar an ideal sojourn to unwind in the tranquil surroundings and cherish the nature’s bounty. The Lodge is divided into two clusters with 12 cottages around the lake and each room opening to a private splash pool overlooking the lake. Spread over 32 acres along the man made lake, Lakshman Sagar offers magnificent views of rustic belt and sunset and sunrise. Nature walks with this secluded resort tour will give you a glimpse of traditional lifestyle of the local tribesmen and an insight into their rural dwellings. The ethnic interiors of the lodge are brightly decorated and give you a feel of residing in a village house with all the modern amenities. The dining experience with Lakshman Sagar tour includes freshly made breakfast of local delicacies, a sumptuous lunch in the fields or beside the lake or a romantic dinner on a float. Guided nature walks around the retreat to explore flora and fauna of the region and a close view of the rustic dwellings. Village walk and a visit to the reservoir where guests can enjoy breakfast in the fields.